Your friendly neighborhood social media giants seemed to have cracked the code when it comes to advertising. But they’ve had more misses than hits so far in their efforts to take a slice of our e-commerce shopping dollars, from the Facebook Gifts experiment (discontinued in 2013) to Twitter’s flagging #AmazonCart. This year, however, it seemed that networks like Pinterest, Instagram, YouTube, and even Facebook and Twitter may have turned the corner on social shopping. Every earnings report, the numbers for Facebook become more staggering—now reaching 1 billion active users every day. And while Facebook is sometimes regarded as a platform more for sharing information than for planning purchases, around 90 percent of Facebook users have nevertheless hit the “like” button on at least one brand. But should brands be leery of the new, apparently retail-friendly features Facebook is offering? Richard Lazazzera of A Better Lemonade Stand, an online e-commerce incubator, said that he thinks merchants need to go into social channels knowing that at some point every channel will make it harder for the merchant to get exposure and speak with customers without paying. Matt Wilbanks, CEO and Co-Founder of HelpSocial, said that the company is working on integrations with a few e-commerce platforms to help them recognize customers when they post about the product or company. With around 307 million active Twitter accounts, and a demographic breakdown favorable to social shopping, Twitter also is seeking that e-commerce sweet spot. Its most developed experiment to-date has been the previously mentioned partnership with Amazon, which allows users to add items to their Amazon shopping cart by tweeting #AmazonCart. The problem is that while the #AmazonCart experiment is being used, it is in relatively low volume. Some experts speculate that “in-stream” social shopping on Twitter might suffer from consumers not being willing to broadcast what they want to buy on their Twitter timelines. We’ll have to wait to find out if their latest features—including the Buy button—see a similarly lukewarm reception. The virtual scrapbooking/ideas/DIY site rolled out “buyable pins” in June of 2015. Pinterest claimed to have around 30 million buyable pins at the time of rollout and that they had been used around 60 million times in the first few months. Buyable pins currently are available to companies working with one of five e-commerce engines: Bigcommerce, Demandware, IBM Commerce, Magento, and Shopify. Lazazzera said, however, that he thinks all merchants need to be very wary of of allowing any other businesses to control, monitor, and manage relationships with their customers. That said, with around 100 million users and 93 percent of those using the site to do research before making a purchase, there is a huge market within this platform. The only major limitation so far seems to be there’s a waiting list if you want to try out buyable pins for your own brand. When it comes to engagement metrics, Instagram is a huge winner, generating 58 and 120 times more engagement than Facebook and Twitter, respectively. Instagram has also been found to be among the best social media platforms at turning a browser into a shopper. Finally, YouTube and Google are in the process of rolling out dynamic product cards within their TrueView platform. Testing has shown improved conversions and branding metrics. Wayfair, a participant in early tests, said that revenue per impression tripled compared to past campaigns. Sephora also said that it saw an average view time of nearly two minutes, resulting in an 80 percent lift in consideration and a 54 percent life in ad recall with True View. Advertisers that already have a Google account representative can use True View immediately; others must wait for further integration. Andy Geldman, founder of WebRetailer.com, said that the social commerce hype machine has been running at full throttle for a while now, but for most businesses it never really got off the ground. 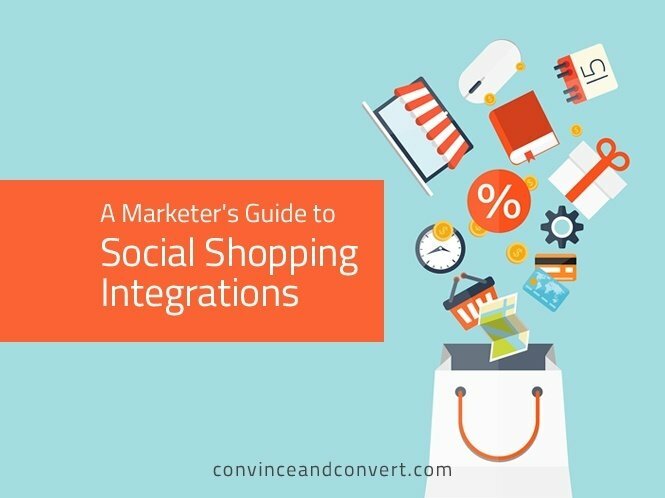 Check out our infographic below, which shares the full scope of where social shopping is and where it’s likely headed in the future. Editor’s note: A version of this post originally appeared on the Slant Marketing blog. Tate Handy is the Outreach Manager at Digital Third Coast, a marketing firm located in Chicago.